I want to send a sincere thank you for your kind recognition of the website design work. You went over the top last Sunday when you presented me with a lovely gift, at the Richard Jolley event at Ignite Studios. 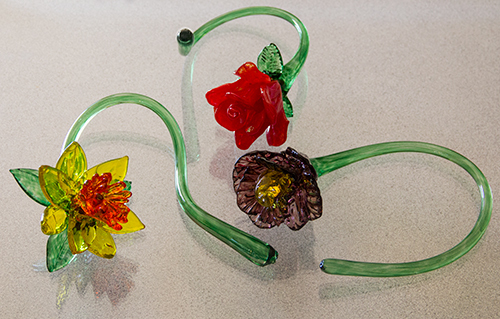 Inside the beautifully wrapped box were these amazing blown glass flowers. I can’t imagine that you knew that I am a gardener who loves to grow a yard full of flowers – you gave me a gift very close to my heart. I am very proud to be a member of this group, and fortunate to be able to have a hand in showcasing the things that we do. The experience, one-of-a-kind opportunities, and education that I receive from MCGAG membership are well worth working on the site. Not to mention meeting such a warm and welcoming bunch of interesting people. I am also lucky in that I am working with a wonderful website partner in keeping the site up to date, as Marcia Weissman does a great deal of work in keeping track of incoming articles, organizing, and posting reports. I hope everyone has a great winter season, and I look forward to seeing everyone again when we start our events again in the Spring.